Focus and 3D projection will require a little bit of tinkering. The price doesn't get better than this for a 4K projector. Annoying off-black frame around image, especially visible on white screens. Summary: Overall, we feel the BenQ HT2550 projector is a strong option for any individual who is new to the world of 4K projectors and wants to enhance their visual experience without breaking the bank. Fans of projection technology have been patiently waiting for 4K projectors to drop in price since the invention of this exciting resolution level. Thanks to a new generation of impressive technological improvements – such as the recent release of cheaper and more powerful DLP chips by Texas Instruments, 4K-enabled projectors have been rapidly decreasing in cost. As this technology has become more and more ubiquitous, we have seen a steady rate of improvement in the overall quality of affordable 4K-rated projectors. While many of these projector models fall around the $2,000 price range, some projectors, such as the BenQ HT2550, can now be found for well under $1,500 at a number of reputable online retailers. As a projector enthusiast, we are sure that these developments have been just as exciting for you as they have been for us. Needless to say, this trend is providing numerous benefits to consumers on any budget – as an increase in the number of affordable, yet high-quality projectors are making it easier than ever for anyone and everyone to create a professional-quality projection setup within the comfort of their own home. As you are likely someone who is interested in creating such a configuration, we have taken the time to conduct in-depth research on the BenQ HT2550 projector. As one of the most affordable 4K-ready projectors on the market, this model represents a strong value that is sure to allow for a great consumer experience – all without breaking the bank or throwing your project off-budget. 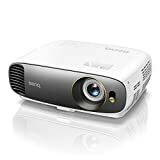 We hope that the following BenQ HT2550 projector review is helpful, as you deserve to make an educated purchasing decision when developing your very own home projection studio. Who is the BenQ HT2550 Projector For? The BenQ HT2550 projector currently represents one of the best value propositions available throughout the budget to mid-range projector market. With a vibrant projection at 4K resolution and the ability to show off 3D-enabled content at 1080p, there are undoubtedly many benefits offered by this BenQ that could help to make your projection studio feel like a top-tier facility. However, such impressive features come with a number of tradeoffs. Looking to create an affordable home theatre that is able to pair a strong mid-range projector with other mid-range peripherals. New to the world of 4K projectors and want to give the technology a try without investing thousands of dollars in upfront costs. Interested in pairing a 4K-capable projector with the ability to transition to 3D-enabled 1080p content seamlessly. Has a projector budget that would allow for the purchase of a more expensive model that would allow for higher-quality features. Experienced low-end 4K visuals before, yet is ready to upgrade their projector to allow for the full, top-tier 4K experience. Does not plan on using their projector to show videos in 3D-enabled 1080p. Due to the nature of 3D content, this feature demands that the BenQ HT2550 must use some lesser components to keep it within the $1,500 price range. Overall, we strongly suggest the BenQ HT2550 projector to any individual who is new to the world of 4K-enabled projectors, as this particular model presents an affordable opportunity for you to learn some of the finer details associated with these powerful devices. What unique features does the BenQ HT2550 have? As we have referenced above, this projector allows you to show videos in either 4K or 3D with a resolution of 1080p. In reality, the fact that a projector in this price range offers 3D projection capabilities places it within a unique group of products. While initial shipments of the BenQ HT2550 came with 3D projection systems that often malfunctioned, this appears to have been a software issue. As such, if you do choose to purchase this projector, a quick and easy firmware update will help to ensure that your unit has the most up-to-date software available – allowing for full utilization of its 3D features with minimal setup time required. With a rating of 2,000 lumens, the BenQ HT2550 isn’t the brightest projector on the market, as it has the same brightness rating shared by many other models that fall within this price range. While this is far from unique, a reasonable level of brightness combines nicely with BenQ’s Brilliant Color function – which makes the colors on screen “pop” by decreasing overall brightness and increasing color saturation – to create for a robust feature set. This particular BenQ projector utilizes the 0.47-inch version of Texas Instruments’ new 4K DLP chips. With 1,920 by 1,080 mirrors packed into such a little chip, this allows the BenQ HT2550 to output a full 4K resolution thanks to the over 8.3 million pixels displayed on the screen through rapid movement of these thousands of mirrors. In other words, this projector is powered by one of the most modern chipsets available – which translates into a more enjoyable viewing experience for yourself and your guests. With a single 5W speaker mounted onto the BenQ HT2550 projector, those who don’t want to purchase an expensive speaker set to compliment their new projector will still have access to a reliable audio source. Impressively, users have reported that this small speaker performs far better than many larger speakers available on projector models that cost thousands of dollars more. While it is doubtful that a projector’s audio would be the driving force behind your purchasing decisions, we are happy to report that the audio present on this particular projector is more than enough to satisfy the needs of portable user cases – such as a backyard movie night or professional presentation. The lamp included with the BenQ HT2550 projector is rated for 4,000 hours in Full mode, with up to 10,000 hours of use possible in Economic mode. Overall, these lamp life ratings are respectable and unlikely to cause significant issues for the majority of readers. Unless you are heavily using this projector (such as 24/7 projection for a business or art installation), the lamp life should not present any issues. However, if you do plan on using this projector heavily, please note that a lamp replacement will run you about $150. While this isn’t a crazy price, it could easily lead to extra and unexpected costs over the life of your projector. Affordability: Coming in at a price point far less than $2,000, the BenQ HT2550 projector packs a ton of value into an extremely affordable package. While many budget-friendly projectors can provide a generally negative user experience, this is not the case with the HT2550. If you do choose to purchase this projector, rest assured that it will be both budget- and user-friendly. Brightness: As previously mentioned, this projector is plenty bright for most use cases, especially when one considers its price point and target market. While its rating of 2,000 lumens does not set it apart from its competitors, it provides enough benefit to users to ensure that dim projectors will not present any issues during indoor and night-time outdoor use. Strong Manufacturer’s Warranty: As is the case with many of the products offered by BenQ, this projector comes with a standard 3-year warranty. The inclusion of such a benefit isn’t revolutionary, but it is indeed enough to place concerned buyers at ease when weighing the pros and cons of investing in the BenQ HT2550. Low Fan Noise: The biggest downfall experienced by many budget projectors is an unbearable amount of fan noise generated by the unit. Thankfully, this does not appear to be a severe issue for the BenQ HT2550 projector. While readers should be aware of the fact that there is an audible amount of noise when the unit operates in Full Lamp mode, dropping the model to Economic mode will essentially silent the fan. Even when in Full Lamp mode, the noise created by the fan is unobtrusive, helping to ensure that you can enjoy your projector with minimal outside distractions. Poor Focus: When setting up the BenQ HT2550, it is likely that your unit will focus sharply towards the edges of the screen – thus rendering the image in the center of the screen unbearably blurry. This appears to have been a significant issue with early units, but there are still a noticeable number of users reporting this issue. While it is fixable with a little bit of tinkering and readjusting, such troubleshooting may be off-putting to those hoping to be able to use their projector straight out of the box. Annoying 3D Recognition: While the 3D projection feature is awesome when it is working, set up can be a pain. Similar to the poor focus issue mentioned above, the BenQ HT2550 appears to be unable to intelligently recognize when a 3D media clip is being broadcasted from the source feed. As such, you will likely have to go into the menu and turn on 3D settings manually to get this feature to work correctly. Once again, this is probably not a deal breaker for most – instead, it is an annoying reality of utilizing a budget-friendly projector within your setup. “Dark Frame” Artifacts: Images and videos projected on the BenQ HT2550 have been known to have an off-black frame projected around the image. It has been reported that this frame can be upwards of 5 inches thick, which can present an annoying distraction when attempting to utilize this model for professional purposes. When projecting onto a black-framed screen, this artifact is less noticeable. However, projection onto a stark, white screen or wall will likely lead to this annoying issue being highly visible to your audience. Input Lag: The BenQ HT2550 projector has a measured input lag of approximately 50 milliseconds, which isn’t too noticeable when watching videos or participating in casual video game competitions. Such a delay can present issues for those of you who are highly competitive gamers, as even the slightest level of input lag can present the difference between winning or losing an intense competition. Generally, issues such as these are to be expected from a projector as affordable as the BenQ HT2550. Regardless, as a valued consumer, we believe that you should have access to a complete picture of what using a particular projector may entail during day-to-day operation. What is an Alternative to the BenQ HT2550? For those who feel that the BenQ HT2550 might not be the right choice for them, yet want to remain in the sub-$2,000 price range, there are many different options available. 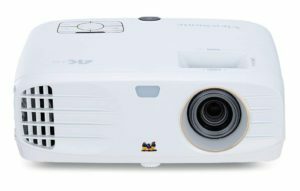 If you are looking for a projector that utilizes the same modern chipset as the HT2550 and has many of the same pros, we suggest looking into the ViewSonic PX747-4K Home Theater Projector. As many of you are likely aware, ViewSonic is an industry leader in the field of affordable 4K projection. While a lower price frequently suggests a lower quality, historically this has not been the case with ViewSonic products. The ViewSonic PX747-4K Home Theater Projector is no different in this respect. As there is no 3D available, the 4K image quality has been reported to be far better than that provided by the BenQ HT2550. While the dark frame around images remains – as this is understood to be a common issue with projectors utilizing the new DLP chipset – it is far less distracting as that of the BenQ HT2550. Overall, the ViewSonic PX747-4K Home Theater Projector offers many of the same benefits as BenQ HT2550, albeit with many of the same flaws that are commonly seen with budget projectors such as these. For those who feel that 3D projection isn’t for them, we highly suggest this ViewSonic projector as a quality alternative to the BenQ HT2550. In conclusion, we feel that the BenQ HT2550 is an excellent option for those who are looking for a budget-friendly 4K/3D-enabled projector and aren’t afraid to play around in the Settings menus to get the best picture quality possible. While the flaws presented by this particular projector model are similar to those seen in many other budget projectors, there seem to be more of them than usual. As such, we can only recommend this to those who are just getting started with 4K projector technology. Alternatively, the BenQ HT2550 presents a substantial value for those looking to have a combination of 4K and 3D-enabled projection technology at their fingertips. As this projector is one of the only models currently on the market that offers a combination of 4K and 3D at this price point, the BenQ HT2550 may be the right option for you if this combination is a deal breaker. 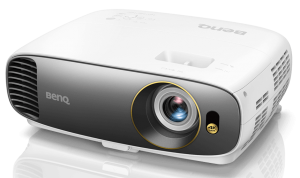 Outside of these two particular consumer groups, the BenQ HT2550 is probably not the best option for anyone looking to purchase a 4K projector. Due to its numerous flaws and quirks, it is likely that you could find a far better projector for a little bit more money – especially if you are willing to research alternative models and wait until a good deal can be had on a higher-quality model.